This Creamy Garlic Feta Dip is perfect for your next grill out! Gluten-Free and Vegetarian, this simple feta dip recipe is one that you will make time and again. I’ve got an amazing Creamy Garlic Feta Dip for you today, but first, let’s talk summer. Can you believe it is right around the corner? I can’t remember when I looked forward to a summer more than this one. I mentioned in THIS POST, that we are spending the next couple months away from it all in the mountains. Mountains = Elevation = Cooler Weather. You know what that means? This Florida girl gets to grill this summer! No more sweltering heat keeping us inside or in the pool. Finally, we will be firing up the grill this Memorial Day and enjoying outdoor entertaining as most people do! I love the simplicity of grill outs. No need to get fussy – simple food that is fast and easy to prepare does the trick. Burgers, steaks…whatever you are in the mood for! You know me, I am all about the side dishes. I can’t be without my chips and dip. 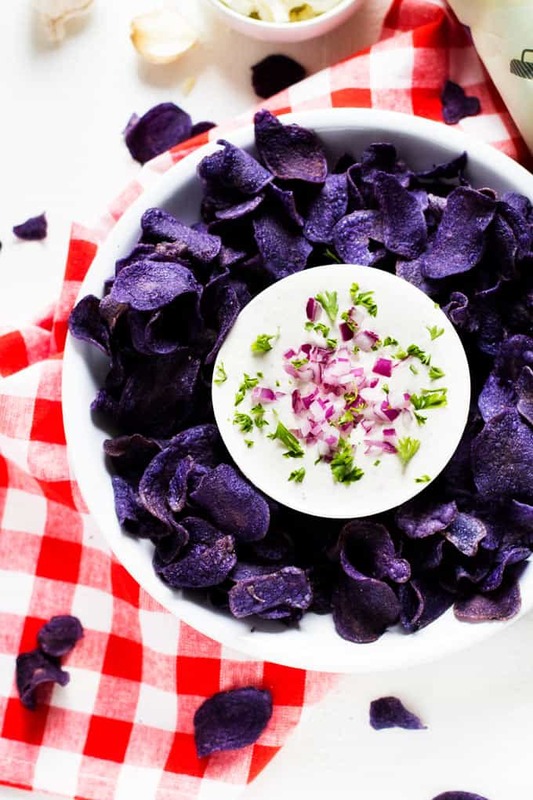 I am serving this Creamy Garlic Feta Dip with Jackson’s Honest Purple Heirloom Potato Chips. They are made with just three ingredients: Non-GMO Project Verified domestic potatoes, organic coconut oil and sea salt (that’s it!). It probably doesn’t hurt that I didn’t tell them that they were more nutritionally dense than regular potato chips. Let’s just keep it our secret that purple potatoes have four times the amount of antioxidants than white fleshed potatoes. I first learned about Jackson’s Honest last month, and we have been buying their products ever since. To say the whole family is in love is an understatement. If you haven’t heard of them, you are going to want to check them out. It is a family run business on a mission for nutrient dense food. They are helping to re-orient the food chain around the role that traditional nutrient-dens fats can play in a healthy and balanced diet. I love how they marry simple ingredients with great taste to create snacks that I feel good about serving. 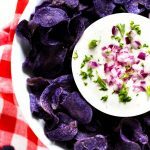 In addition to these amazing Purple Heirloom Potato Chips, they offer a full line of Potato Chips and Tortilla Chips that would be great with this Creamy Garlic Feta Dip. All of their products are made with wholesome non-GMO ingredients! This Garlic Feta Dip is perfect for your next grill out! Gluten-Free and Vegetarian, this simple feta dip recipe is one that you will make time and again. Place all ingredients in a food processor and process until smooth. Refrigerate until serving. 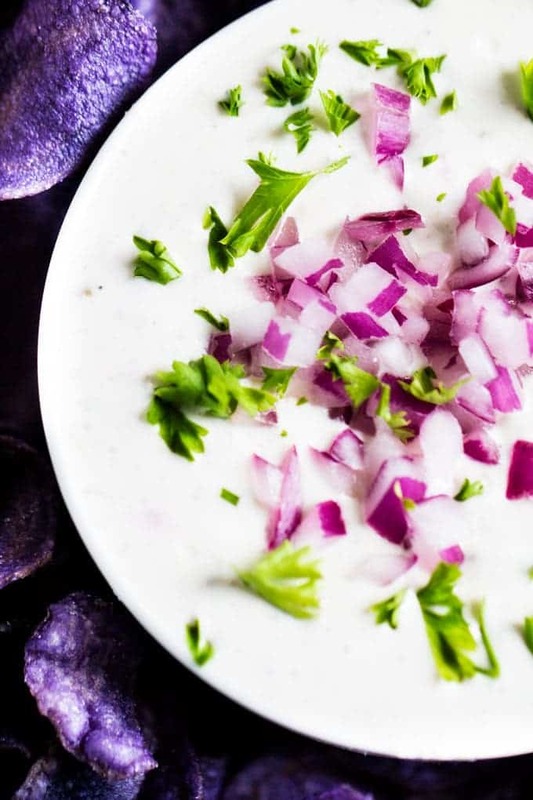 To serve, garnish with red onions and chopped fresh parsley and serve with your favorite Jackson's Honest chips. Oh my what a delicious sounding dip and who good do those crisps sound as well! I would definitely be up for trying both. 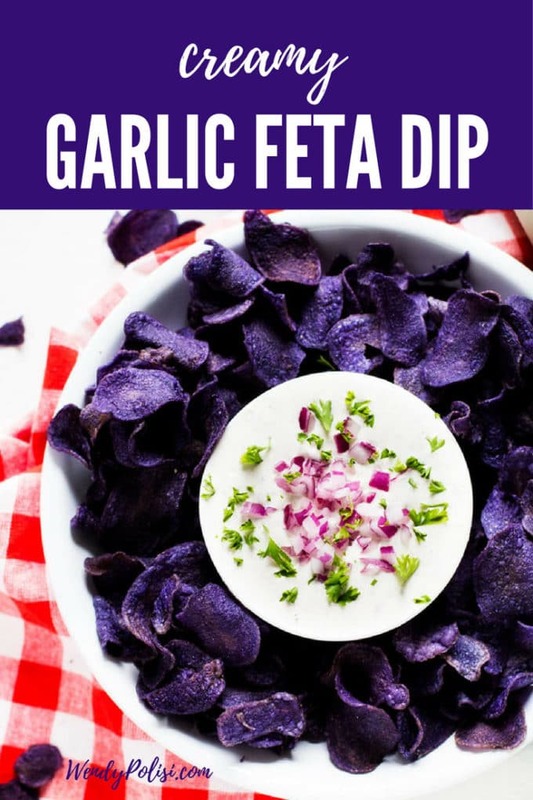 This dip looks so good, feta cheese is one of my favorites. I will have to try the Jackson’s Honest Chips. Thank you. You will love them! Oh yum! I need to try this dip AND those chips. It all sounds so delicious. Thanks, Stacie! I hope you enjoy it as much as we did. This sounds like a really fun new dip to make this summer. I like the hint of spice! 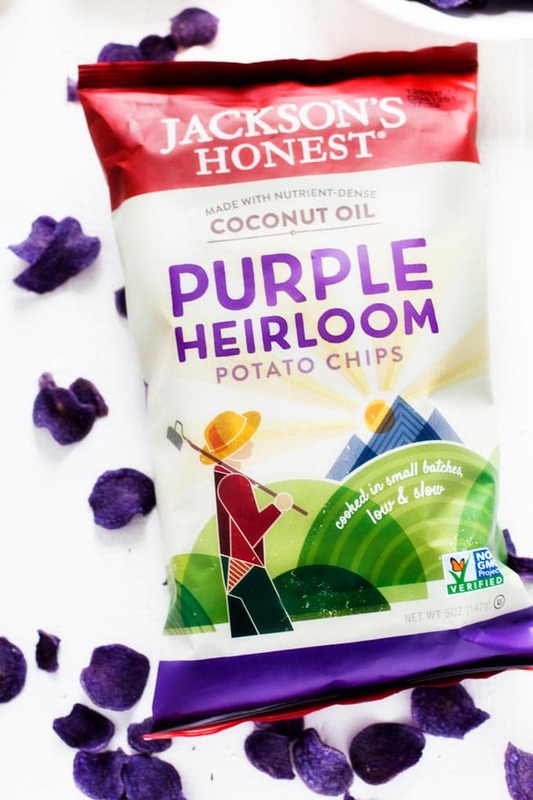 I love how pretty the purple heirloom potato chips look with it! Thanks so much Liz! The color of the chips really does make for a great presentation. 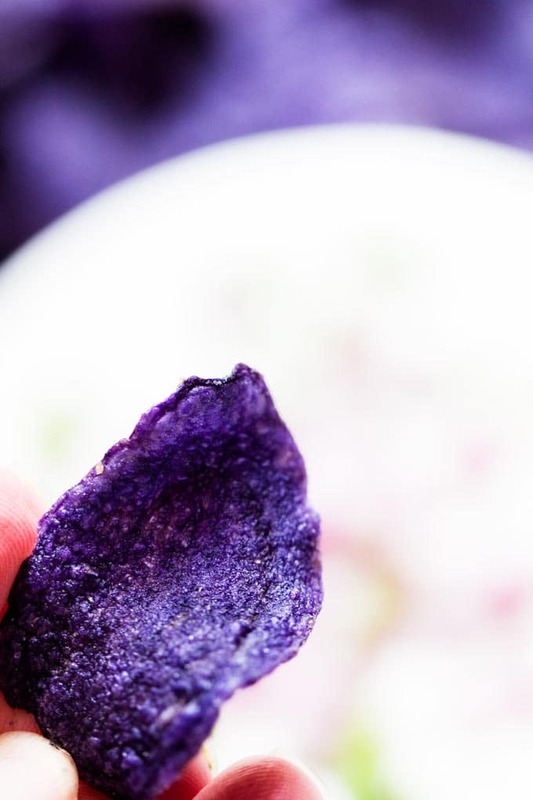 My daughter loves purple potatoes so she would love this purple potato chips. Also this feta dip sounds yummy. You combine my two love, garlic and feta, into one dish? I’m sold! I honestly have never had a purple potato before, but the chips looks fantastic! Thanks so much! They are really great chips. I’m game to try these with or without dip. A guilt-free potato chip is everything! I am a feta fanatic!!! 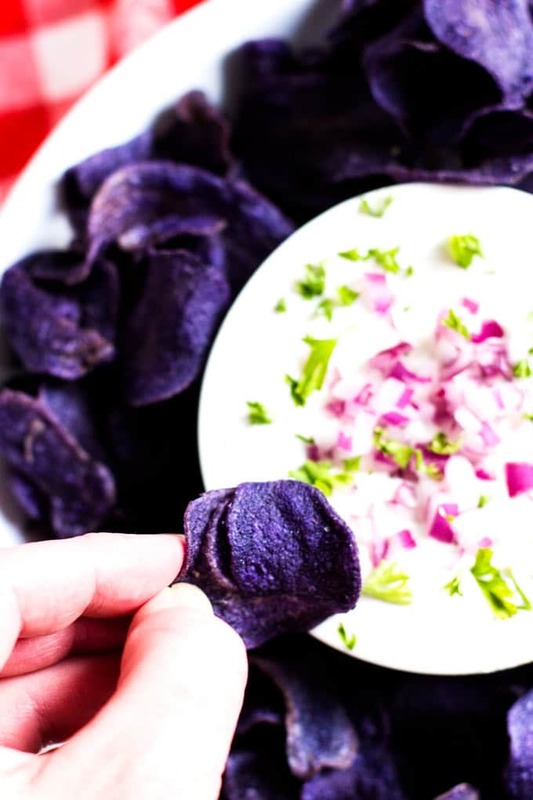 I will definitely be making this dip and those purple potato chips are so neat! I love the gorgeous color! This looks amazingly good! Purple chips, huh? ! Awesome – this really looks like it would stand out in a party! I like the dip idea also: yum-yum garlic. Yum those chips and that dip looks so good. What a fun little snack. It would be perfect for the afternoons around here, I am always hungry for something like this! Mmmm…this sounds so good! I am in need of a new dip to try out. This would be the perfect one to try. Dips are my favorite when company is over. The garlic feta sounds really good. The dip looks divine! I would love to have this dip like everyday! I have never tried purple potato chips before. Do they taste the same as regular potato chips? I guess I have to get some of those Jackson’s to find out. Thanks for sharing excellent informations. Your website is very cool. I am impressed by the details that you have on this website. It reveals how nicely you perceive this subject. Bookmarked this website page, will come back for extra articles. You, my friend, ROCK! I found just the information I already searched all over the place and just could not come across. What an ideal website.